Gov. Tim Pawlenty has released a series of proposals designed to crack down on criminal activity by undocumented immigrants. The governor wants to form a team of state agents to enforce federal immigration laws, enact stiffer penalties for using false documents, and increase monitoring of illegal immigrants who have been arrested. 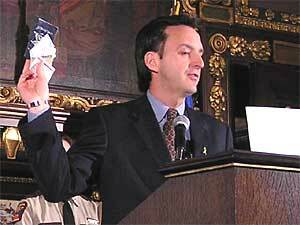 Pawlenty says the proposals will protect the public, but some police officials are skeptical. St. Paul, Minn. — Flanked by several state and local law enforcement officials, and holding a handful of fake ID cards, Gov. Pawlenty announced his seven-point plan to get tough on illegal immigration. At the start of his news conference, Pawlenty was careful to say that he respects the work done by legal immigrants in Minnesota. But he says that work is being overshadowed by undocumented immigrants. "There needs to be room for a thoughtful, reasoned debate about where we go from here, as a nation and as a state, with respect to illegal immigration," said Pawlenty. The governor's proposal would create a team of 10 law enforcement officers trained to question, detain and arrest suspected illegal immigrants. The federal government is mostly responsible for that work and would have to approve the idea. Pawlenty is also calling for tougher penalties for anyone creating, possessing or selling false identification documents, and increased fines for businesses that hire undocumented workers. Pawlenty says he based his proposal on discussions with local police officers. He denied accusations that his motives are primarily political, saying the issue is being discussed across the state and nation. "You have to be really living under a rock to survey the country, the concerns of the country, the concerns of the folks standing here and others, and say that illegal immigration is not a legitimate issue," said Pawlenty. -The Minnesota Illegal Immigration Enforcement Team would consist of 10 state agents who would focus on illegal immigrants who violate laws against human trafficking, identity theft, methamphetamine dealing and terrorism. The officers would get special training and the authority to enforce national immigration laws, if federal approval and legislative funding came through. -Possessing fake identification isn't against the law in Minnesota unless the person intends to commit a crime with the fake documents. That would change under Pawlenty's proposal, which would punish false ID possession with up to a year in jail. Creating or obtaining false ID documents or using multiple identities would carry stiffer penalties. -Hiring illegal immigrants already carries federal fines. Pawlenty would like to tack another $5,000 in state fines onto that offense if it's done knowingly. -Those who traffic humans would face tougher penalties when the victims are underage. The governor would also create a task force on human trafficking. -Local law officers would be required to collect more information on the citizenship and immigration status of those they arrest and pass that data along to the Bureau of Criminal Apprehension. -Minneapolis and St. Paul currently ban their police from enforcing immigration laws in most cases. Pawlenty would like to prevent cities from passing such sanctuary ordinances, saying it ties the hands of law enforcement. Worthington Police Chief Mike Comiskey joined Pawlenty at the event. He says he's glad the governor is addressing the issue and is calling on the federal government to do more. He called illegal immigration a dark underworld that needs to be cleaned up. It's difficult now to get members of those communities to report crime and to work with the police. So I can see that magnifying exponentially if local police were given the authority of INS officers. Comiskey says it's important for police to address problems like illegal human trafficking and the wide use of false identification. "We have these second-class issues that, because of illegal immigration and the need for the workforce to get here, it seems like we've winked and nodded at some of these issues. and now we need to rein in what we've created," said Comiskey. While some law enforcement officials applaud Pawlenty for his proposal, others are skeptical. Minneapolis Police Chief Bill McManus says he opposes Pawlenty's proposal to overturn local laws that forbid police from questioning a suspect's immigration status. McManus says Minneapolis police have a better working relationship with immigrants, when they know they won't be questioned. "It's difficult now to get members of those communities to report crime and to work with the police," said McManus. "So I can see that magnifying exponentially if local police were given the authority of INS officers." Chaska Police Chief Scott Knight says he wants more detail on how the proposal will help local police officers. Knight says he's concerned that the governor's enforcement team may move into local communities. He says that could cause problems for local police, because immigrants may not be able to distinguish between law enforcement agencies. "We, who have to provide the public safety services for our community, need the tools to perform that job without having some outside entity come in and make a mess in our backyards, and go home leaving us who live here to deal with the aftermath," said Knight. The governor's proposals need the approval of state lawmakers, who return to the state Capitol on March 1. It's certain to be a divisive issue, especially after the governor's office released a controversial report last month saying undocumented immigrants cost Minnesota taxpayers $180 million a year. Some question the credibility of the report, saying it didn't discuss the benefits of those workers. Rep. Carlos Mariani, DFL-St. Paul, says the tone of the report has upset many in the immigrant community. He says that could damage the governor's credibility when he talks about these issues. "It really forces a lot of good people away from the governor -- who actually could be working pretty effectively with him on some better public policy in this area -- because they're suspicious about his intentions," said Mariani. Mariani says, however, that he can work with some of Pawlenty's proposals. But he questions the severity of illegal immigration in Minnesota, saying the problem is much worse in certain sunbelt states. The governor says in the coming weeks, he plans to outline other proposals that would encourage legal immigration.